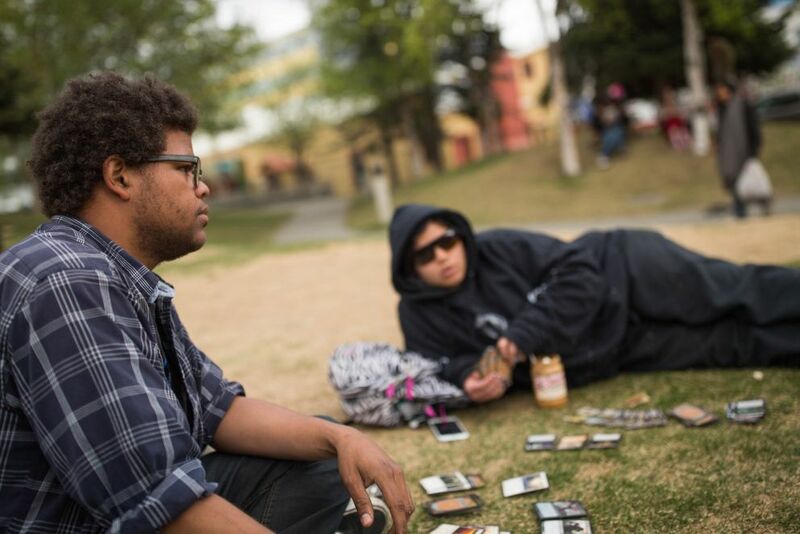 Some of the regulars in Anchorage's Town Square Park come to meet up with friends or sit in the sun. Others come for the drugs. But among city officials, downtown business leaders and even the square's strongest advocates, there's a mounting consensus the park — an urban plaza in the heart of downtown — no longer belongs to everyone and is in need of radical change. A small community dominates the scene. Teens kick-flip skateboards. Homeless adults sit or lie on the grassy knolls for hours on end during work hours. People nap curled up in blankets or sleeping bags behind the lip of a stone fountain that hasn't worked in years. "We're enjoying the sunlight, man," said Brian Sims on a recent weekday, standing by one of the plaza's artificial hills, a crowd of people behind him. "If you're homeless, why would you not come to Town Square on a sunny day?" The sense among others, though, is of not belonging, no matter what the weather. 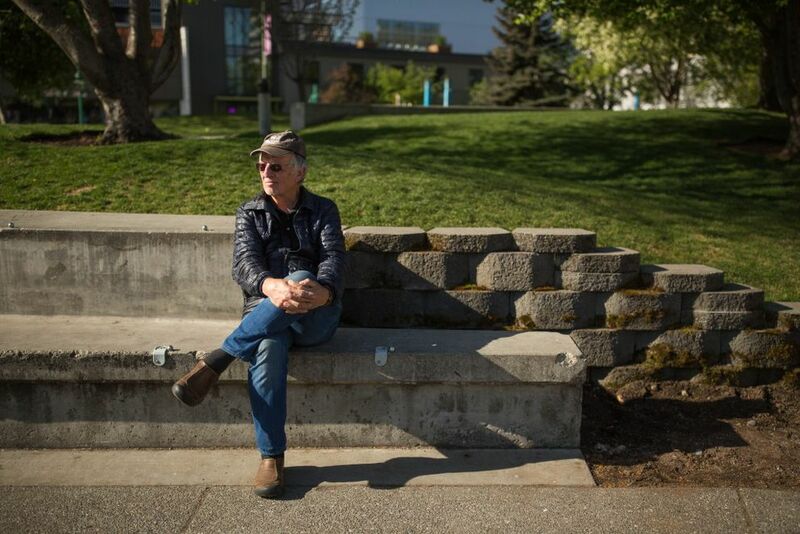 John Blaine, a close friend of Ruth Moulton, the community activist who led the battle to create Town Square in the 1980s, toured the park recently with city officials and felt like an outsider. He said he was struck by the looks he got. "Some of the people that I saw just last week looked at me as if I shouldn't be there," Blaine said. "And I don't understand that. There has to be mutual respect." 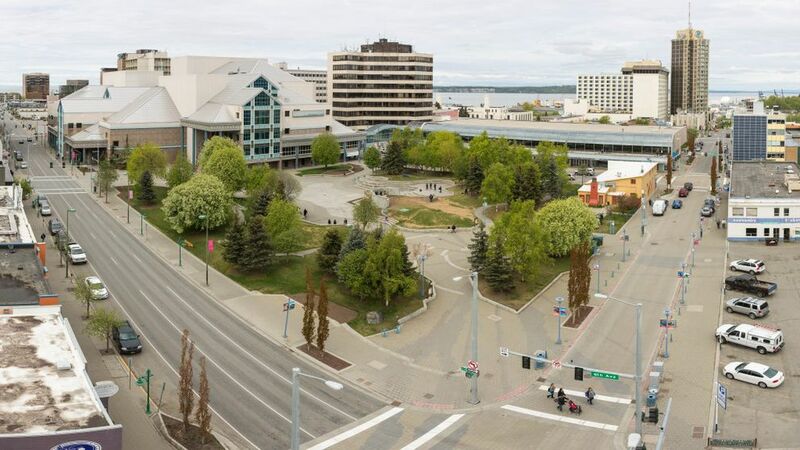 A frustrated Jamie Boring, the executive director of the Anchorage Downtown Partnership, recently went so far as to suggest the park be put in private hands to curtail public access. Boring's organization deploys yellow-vested "security ambassadors" to patrol downtown streets, and Boring said the ambassadors constantly observe drug use and disorderly behavior in the square. He said he thinks most of the square's regulars are there to have fun and enjoy the sunshine, but he wants to stamp out the few who use it, he said, as a "cover" for less wholesome activities. On Tuesday afternoon, Boring was filling out a police report. He said someone in Town Square had thrown a utility cover and hit a maintenance supervisor in the head. Problems, or the perception of problems, in Town Square aren't new. But the chorus of concern mounts every year. 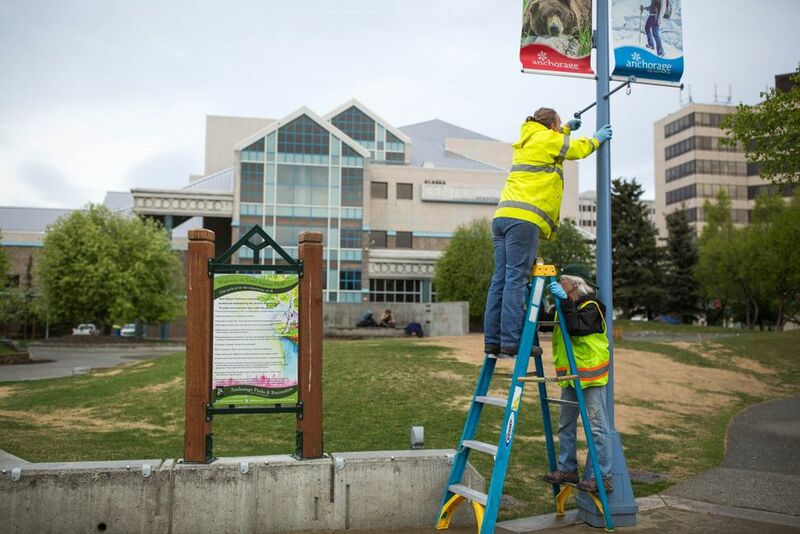 In 2014, a University of Alaska researcher made the square a case study for problems in urban parks. That same year, nearly 100 people gathered at a design workshop to brainstorm ways the plaza could be made more inviting. The recommendations from the workshop, recently provided to Alaska Dispatch News in draft form by former Anchorage Assemblywoman Sheila Selkregg, include opening up the park by removing or altering the fountain — though it stops short of recommending the hills be taken out — and bringing in more people, not just in the summer, but year-round. People who regularly hang out in Town Square see the situation differently. Or at least, they feel as misunderstood as Blaine. "People judge all day long, and I hate it," said Chantel Bates, 33, sitting on a stone wall near Fifth Avenue, unwrapping a package of socks and glaring. She said she's been homeless in the past and now has a place to stay, but she chooses to spend most of her time at the park. Bates nodded her head across the square toward people sitting on hills. Town Square passers-by "don't know nothing about what these people went through," she said. "They get it bad all day long. They are homeless, but so f—— what?" But Bates said she sees problems in the park too. "It used to not be this bad. It's horrible," Bates said. "Open drugs and drinking." Town Square Park opened in 1991 to big expectations. Paved sidewalks meander through a hilly landscape designed to buffer noise from busy Fifth and Sixth Avenues. The place is tiny, about the length of a city block, but it has many geographic and design features. Community activists successfully pushed to enshrine the park in the city charter, which is like the city's constitution. A boulder in the southeast corner, at the intersection of E Street and Sixth Avenue, bears a plaque memorializing Moulton, who spearheaded efforts to sue the city through the 1980s to prevent the land from being developed as a new convention center. Moulton, who died in 2006, and others envisioned the square as an oasis from the business of city life. But two and a half decades after the square first opened, police officials in particular have concluded the layout offers too much seclusion for illegal activity. On a rainy morning last week, Charlie Kinnavak leaned against Moulton's memorial boulder, scanning the sidewalk. A few moments earlier, he paid $5 for a stick of the synthetic drug Spice. "I like Town Square because it's open," Kinnavak said. "People can hang out and smoke Spice." In a recent email to his board, Boring, of the Downtown Partnership, questioned whether his organization could lease the square and other downtown public parks through a maintenance contract and "call them private space." He said that arrangement — which city officials said probably wasn't possible — would allow the partnership to clean the park, host events and expel anyone violating codes of conduct. Boring told his board downtown ambassadors tried to encourage 37 people to move out of the park within a four-hour time frame, a third of whom had sleeping bags, blankets and backpacks. 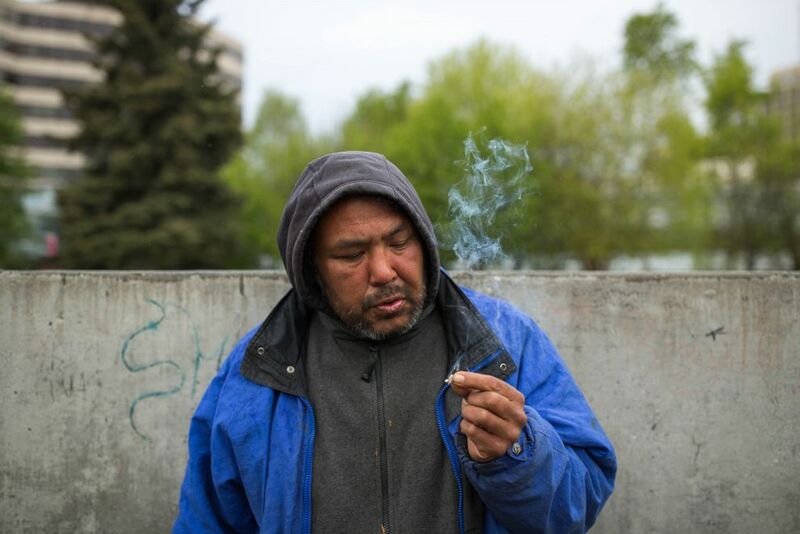 He said most were observed smoking tobacco or doing drugs, though police statistics show just 37 drug-related arrests in and around the park since January of last year, compared to 113 at the downtown bus depot a block away. 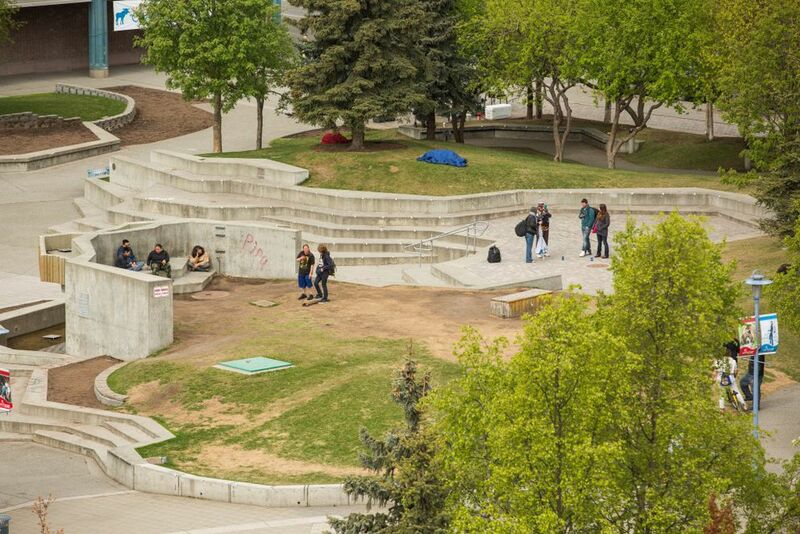 In an interview, Boring said people using and dealing drugs and camping in the square have effectively "privatized" the space for themselves. On a recent weekday, Breanna Witzke, who delivers newspapers for ADN and also works as a personal care assistant, was playing hacky sack with a group of teenagers in the square. Witzke said she'd been coming to Town Square since the early 1990s. Back then, her friends were Goths who hung out in the square and tried to promote peace, she said. There was a "little more riff-raff, faster-moving drugs," Witzke said. "Back in the day we had all that pushed out." Through her care assistant job, Witzke said, she and her client now come to the square with snacks and water for the teenagers, and try to steer them away from drugs. "There's really nowhere left in Anchorage you can loiter. Town Square is it," Witzke said. There's no local law against loitering, but some say the gatherings of people who have nowhere else to go can be intimidating. "I can't let my eyes off of her when I'm down here," Kristi Luttrell, 23, said of her 5-year-old daughter Kacey, as the two ate lunch in the far northeast corner of the park where a hot dog vendor set up shop. Luttrell said there are parts of the park she doesn't feel comfortable walking with her daughter. She said a playground would help open up the space and attract more families. On a recent walking tour of downtown, Tanya Iden said her son's elementary school class avoided Town Square Park entirely because the teacher didn't feel it was safe. "Right now, Town Square … it seems like there's a lot of folks there that are suffering, and it doesn't feel like a place for everybody," said Iden, an urban planner who works downtown. Since the design workshop and police study two years ago, there's only been minor improvements to the park. A furor erupted in the summer of 2014 when the city cut down trees without telling the public first. 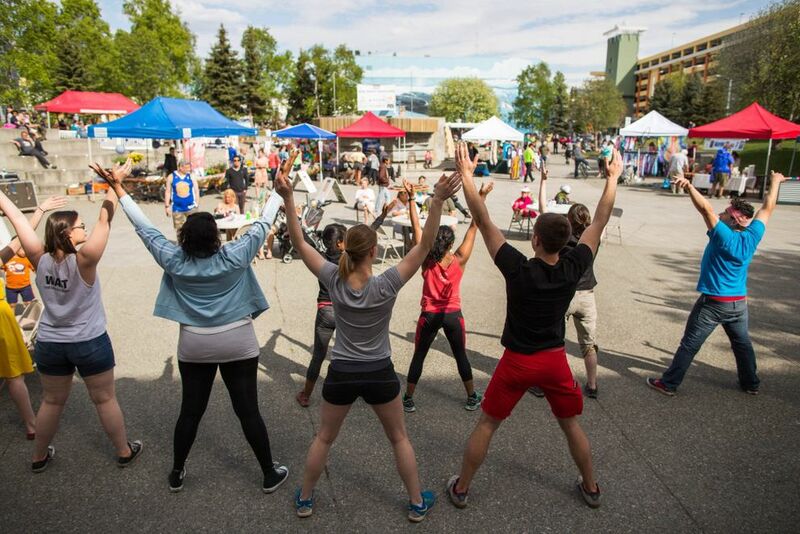 This spring, the city is installing a new irrigation system and lighting upgrades using voter-approved bond money, and groups like the partnership are planning summer events to liven up the square. Long-term discussions about big changes have yet to be mapped out. 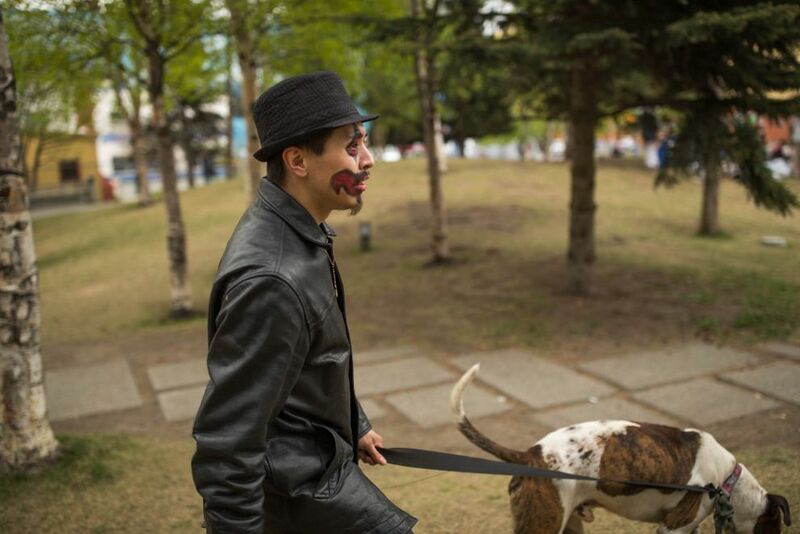 In an interview in the park, Anchorage Mayor Ethan Berkowitz pointed to his administration's efforts to find housing and social services for people who are homeless. He said a goal is to offer other activities to make the park a less attractive place to hang out for people with nowhere to go. Berkowitz advised a reporter to talk to people hanging out in the square. "The stories are interesting," Berkowitz said. "The folks there aren't the folks people think they are." 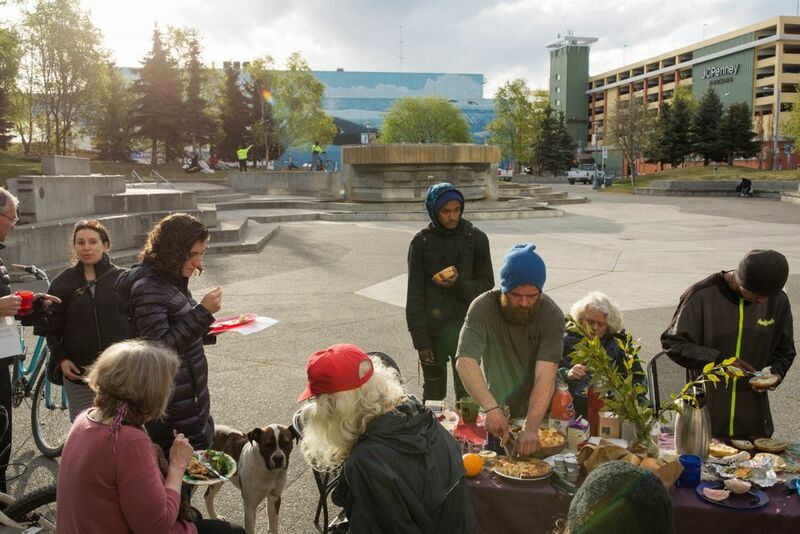 Bree Kessler, a community activist who hosted a "pop-up breakfast" — a trend of bringing temporary events to underused urban spaces — in the square recently, said she was concerned Boring and others are suggesting the park be open only to working professionals. She said more people need to be involved with discussions about changing the square. "The conversation has remained the same for 20 years," Kessler said. About two dozen people showed up for the breakfast. At one point, a few people who had been sleeping in the park walked over, drawn by the food, Kessler said. She said the park dwellers sat down to share food and a conversation about politics — one man wanted to know the group's thoughts on Donald Trump. Loren Holmes contributed to this story.